When i spot a PCB on ebay with a printon saying ‘BD’ or ‘Tamburin’ i simply can not resist. So i also had to aquire this one for some bucks. I have no idea in which organ or whatever this PCB originated. The side of the PCB had some spring contacts, most probably for a keyboard. 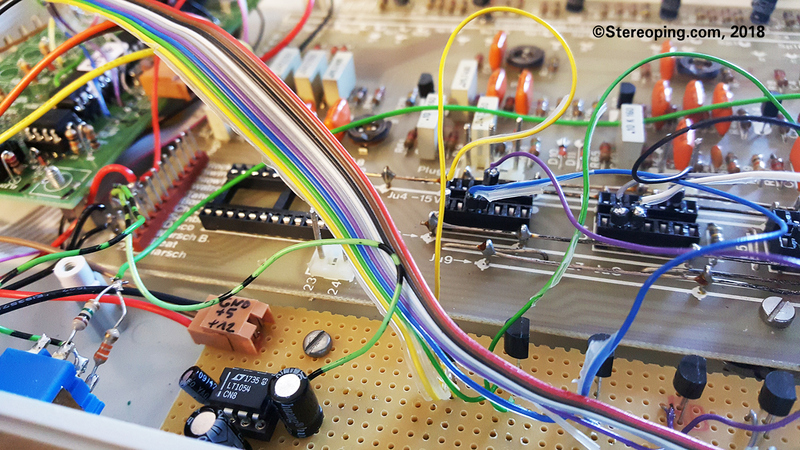 All connections are well documented, bipolar power supply, audio output with some op amps and in the bottom left corner a WERSI custom IC holding 12 Rhythms labeled WIC8060. There are 3 other ‘special’ Wersi-ICs labeled WIC6020. Obviously these are ordinary 4066 analogue switches. 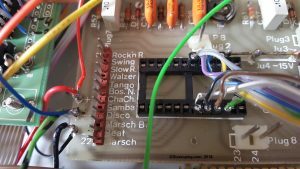 The rhythm chip wants -15V (!) for power supply – the Drum-Instruments also need just -15V to generate their sounds. The positive voltage is only used by the opamps, one for the output and another for … i dont know, i did not investigate on that. As the whole unit needs a quite small amount of power i generated the negative voltage with a LT1054 inverter. The trimpots are for adjusting levels only, no sound tweaks here. The pinheaders ‘Plug 2,3,4…’ allow muting of the individual sounds by pulling them to GND. All in all i was not that impressed by the presets rhythms. I decided to get the Chip out and to just implement a midi trigger interface. The imho weakest sound is Cymbal, it comes in 2 flavours, short and long decay, obviously for open/closed HH. But the sound is quite highfrequent and weak. The ‘HiHat’ in contrast sounds beautiful. One strange thing is, the Hihat’s decay ALSO changes if the last triggered Cymbal sound was the short or the long one. Even more strange: the HiHat is not connected to the Rhythm chip, it looks like it was not used at all in the real machine – i dont know, maybe with some external cables for the pinheaders which i dont have. However, the Hihat got it’s own trigger channel now and also could be modded: the decay envelope is shortened by connecting different resistors between the discharging capacitor and GND. There are different HiHat decay variations in the sample pack below. Here are some free WAVs for Download to be used in music productions. It is not allowed to use them on Sample CDs or selling them in any way. The interface changes midinotes into 5V trigger signals. They are simply transformed into the desired -15V triggers by JFEts (2SJ103), no additional electronic parts necessary. The midi interface got a shift register to offer LEDs for each channel. I misused a 7 segment LED display for indicating individuel trigger events. This way i only had to cut one opening in the case and it now looks quite interesting. Furthermore there is a Midi Learn button, Midi jack, flipswitch for different HiHat decaytimes, 6.3mm output jack and a volume knob – futuristic and minimalistic look.